Some of the world’s oldest cave art is too old to have been made by modern humans, researchers say. 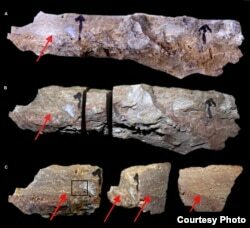 Studies suggest that Neanderthals were responsible for creating cave drawings found in modern-day Spain. They also appear to have painted and cut holes in seashells for use as jewelry. Reports on the studies were published in the journals Science and Science Advances. Neanderthals were related to Homo sapiens, the scientific name for modern human beings. Neanderthals lived in Europe and Asia before disappearing about 40,000 years ago. Around that time, scientists believe, Homo sapiens arrived in Europe from Africa. Researchers say the new studies provide evidence that the artwork was made about 20,000 years before modern humans came to Europe. Roebroeks, who was not part of either study, is a professor at Leiden University in the Netherlands. Until now, most scientists thought all cave paintings were the work of humans. In the first study, researchers examined artwork in three caves in northern, southern and west-central Spain. They attempted to estimate the age of three paintings. Modern technology has made it easier for scientists to date each painting. They used a process called the uranium-thorium method to estimate the age. The scientists removed small pieces of rock material that had formed on the surface of the artwork, and studied them in a laboratory. They found the cave art dates back to 64,000 years ago. Dirk Hoffmann, of Germany’s Max Planck Institute, said the artwork is simple, but important for what it represents. He said one work is a collections of lines that look like a ladder; the others include red marks and rounded objects on rock formations. Another painting is in the shape of a hand. Making the image of the hand involves many steps, Hoffmann and the other researchers noted. This led them to decide that it was a slow, thoughtful creation. 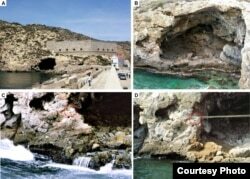 The second study attempted to identify the age of shells that had been colored and cut in another cave in southeast Spain. Researchers studied rock that had formed above where the shells were found. Their investigation found that the shells were around 115,000 years old. This is about 20,000 to 40,000 years older than comparable artifacts linked to Homo sapiens. Those objects were found in Africa or Western Asia. Researchers said the findings show that Neanderthals and Homo sapiens shared similar thinking. They said this suggests the two species were not all that different in their mental ability. “Undoubtedly, it is showing Neanderthals were thinking and behaving just like modern humans,” said University of Southampton professor Alistair Pike. “We should no longer think of them as different species, just humans in different places,” he added. Pike helped to prepare a report on the studies. Some experts have yet to be persuaded by the findings. Harold Dibble, an archaeologist at the University of Pennsylvania, studies Neanderthal behavior. He wondered if the coloring and holes in the seashells could have happened naturally. He also said he would like to see the dating on the cave artwork confirmed by another lab. Malcolm Ritter reported this story for the Associated Press. Phil Dierking adapted his report for VOA Learning English. He also used information from VOANews.com. George Grow was the editor. Do you think that Neanderthals were capable of making art? We want to hear from you. Write to us in the Comments Section or on our Facebook page.